Holyfield’s Boxing isn’t just a chance to cash in on Evander’s name – it’s also an enjoyable and well made boxing sim. You’ll get to create and customize your own pugilist, and then make the most of their career in the goal to be remembered as “The Greatest”. Though you do fight the title boxer himself along the way, you don’t necessarily have to aspire to “eat Holyfield’s chillun” to enjoy the game. In fact, only a passing interest in the sport of boxing, or in beating people retarded, is all that’s required. 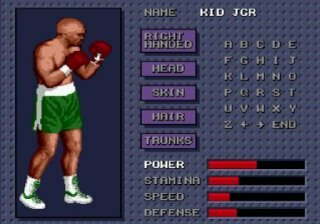 Unlike another game featuring a well-known fighter (Tyson’s Punchout! ), this game attempts to be a simulation of boxing over a straight arcade-style brawler, and as such, things are much slower-paced and realistic. Though you can fight exhibition matches between the game’s regular boxers, the meat of the game is in the Career mode where you create and guide your own fighter to boxing victory. With character created, you’ll fight your way from a lowly 30th ranking all the way to the championship and beyond. Though one main goal is to topple Holyfield for the title, the game’s overall goal is to earn career winnings of over $50 million before you’re forced to retire after 40 fights. If you pull it off, your boxer will replace Holyfield in the hall of fame on the main menu. Since it’s a boxing sim, a lot of factors weigh heavily on every fight. Pervasive stats are probably the most important, and what you’re capable of in the ring is based on four simple factors – power, stamina, speed, and defense. Initially you start very low, but can adjust how your skills are spread out when you customize your boxer. Training between rounds will increase these. Most of the stats are obvious, except for speed and defense. Speed is surprisingly important, and not only dictates how fast you punch, but how fast you move around the ring; your first fight will be like watching two elderly men throw down. Defense controls a system of automatic protection. You have a block button, but with points in this stat, your boxer will automatically deflect a percentage of the shots thrown at him. The stat system also affects your opponent, and will generally dictate what kind of match-up your fight will be. The stats are a welcome part, balanced very well, and unlike most RPG-like stat systems, make a noticeable difference in each of the areas. When you step into the ring, your fighting will be done from a side view. However, the game uses a unique 360-degree panning effect that allows you to move around the ring freely, while the camera still tracks you from the side. It’s really something you have to see in motion to understand, but I’ve never seen a 2-D boxing game do it like this. It actually has more in common with camera movements of a 3-D boxing game, which is an accomplishment of forward thinking. A small overhead diagram of the ring shows the position of the two boxers, and the camera, so you can use it as guide to actually force an opponent into ropes or the corner and pummel him. Controls work decently enough, but this is definitely a game that could have benefited from support for the 6-button pad (which unfortunately wasn’t out yet when the game was released). This leaves you with a system where the A button controls your left hand, the C button controls your right, and B blocks. Head shots are triggered by punching up and a punch button, body shots, down and punch. Hooks require you to push forward on the pad. Of course, the pad still controls your movement, so up and down move you between standing and ducking, and forward sends you running at your opponent, throwing hooks all the way. Conversely, you have to stand stock still to throw jabs – any movement and it becomes a different punch. This is problematic because it’s not natural. You can get used to it if you concentrate and give it some time, but even then you’ll find yourself slipping up and stumbling when you mean to be uppercutting. When the game is named after you, this generally means you'll be the baddest mother in the valley. Fights themselves are pretty lengthy affairs, and you’ll certainly get your ticket’s worth. At the lower ranks, where fights have fewer rounds, you’ll be lucky to see a KO. But once you get a little tougher and your fights run a little longer, you can start sending opponents to the canvas. Every time you take a punch, you lose some of your energy. This recovers quickly, the speed of regeneration determined by your stamina rating. However, every hit also actually shortens your energy bar, meaning there’s less energy for you to recover as you take a beating. On top of that, there are separate body and head meters that drain as you take a hit to that location. The more drained they are, the more energy damage subsequent hits to those areas will cause. If those meters deplete, they start flashing, and if you continue taking punishment without being knocked out, then your trainer will end the fight before your opponent can end your career. These are automatic, so there’ll be no Rocky IV-style fights to the death. Of course strategy is the key to the “sweet science,” and Holyfield’s Boxing does make some acknowledgment to this fact. As I said before, the stats actually do affect a boxer’s performance, so you know how to adapt your style going in. The controls allow you to get some basic left-right sort of combos in, and they even factor in the differences between left and right handed fighters. However, strategy is not really as important in this game as it probably should be for a boxing sim. Though you could theoretically focus your training on speed over power, or the other way around, you’re never going to see a true match-up between a fast striker and a hard hitter. Your opponents always balance their stats to be as well-rounded as possible (Holyfield has full bars on all stats), which in turn strongly encourages you to follow suit, as they have no clearly exploitable weakness. As for actually fighting, the automatic defense stat takes a little of the challenge out of defending yourself, and your opponents are easily countered by hitting the opposite of where they’re blocking. However, this is often haphazard, as the controls really aren’t precise enough to allow you to quickly throw jabs in one direction, and immediately switch to the other. Holyfield’s graphics are actually very well drawn, and the panning I talked about in the ring works quite well. The sounds are of lower quality, with good crowd cheers, but generally dull and powerless punching effects. The music is also a mixed bag, with a decent intro theme, but a horribly bleepy menu riff for the training and fighter select screens. Controls, as I said, suffer terribly from lack of a 6-button controller, but are probably the best they can be for what was available at the time. 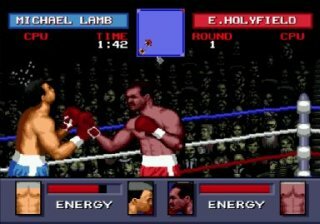 Bottom line is, if you’re interested in a console boxing game with a little more detail than Punchout!, then Holyfield has your answer. Well-crafted boxing simulation with sharp graphics. Strategy is there, but could be more defined. Controls have a glass jaw.